First, we carefully measure the dimension of the object(s) you will carry. We factor in shapes, sizes, and weight. All our cases can be custom tailored to the exact needs of our clients, whether they need to carry medical equipment, computer hardware, or camera gear. We then place objects on the foam to decide where items should be laid out in your case. 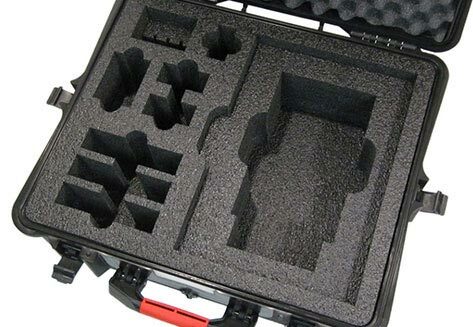 Determining where things will go in the case is essential to protect your gear. We will try different configurations to decide on the best fit for protection. Heavier or larger objects are kept in near the hinges, and smaller items are found closer to the latch. It is essential to factor in the depressing of foam under the weight of the objects. More massive and fragile objects need more foam for protection. Final foam inserts are cut and carefully affixed inside the case. It is crucial that foam doesn’t move while the case is being used. For more information on custom, blow mold cases, you should not hesitate to give our team a call. We offer the highest quality carrying cases.